The half width of 12nm is optimized for the use with common CCD cameras and allows the use of very fast optics. It should be noted that the filter has a transmission of up to 99%, which cannot be attained by stacking more narrow-band filters. A further note, which led to selecting the half width (FWHM), is the dark current of common CCD imagers. Exposures with a CCD cooled to -15°C are limited by the dark current, even in large cities with a bright background. Another advantage of the 12nm filters is the availability of guiding stars for cameras with a built-in-autoguider (SBIG). 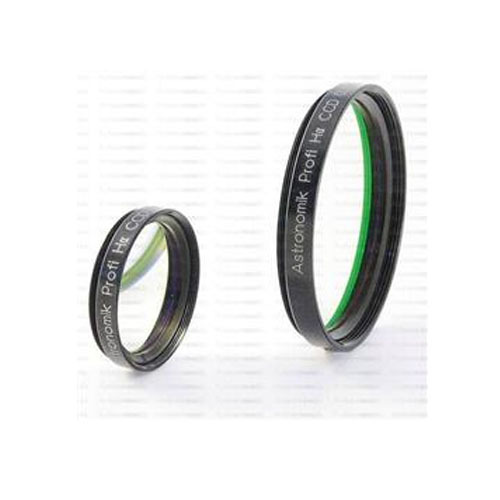 If you use a very strong filter like our 6nm filter you often won't find a usable guidestar. The Astronomik 6nm H-Alpha filter may NOT be used for solar observation.